Fugitive Sees 'Wanted' Post Of Himself, Makes Date To Turn Himself In Anthony Akers, who was wanted for failure to comply with the terms of his probation, became an Internet sensation after exchanging a series of Facebook posts with police in Washington state. Here's a new twist on the meet-cute story. It's not so much a boy-meets-girl situation that ends in happiness as it is a cops-meet-fugitive sort of tale that ends in jail. 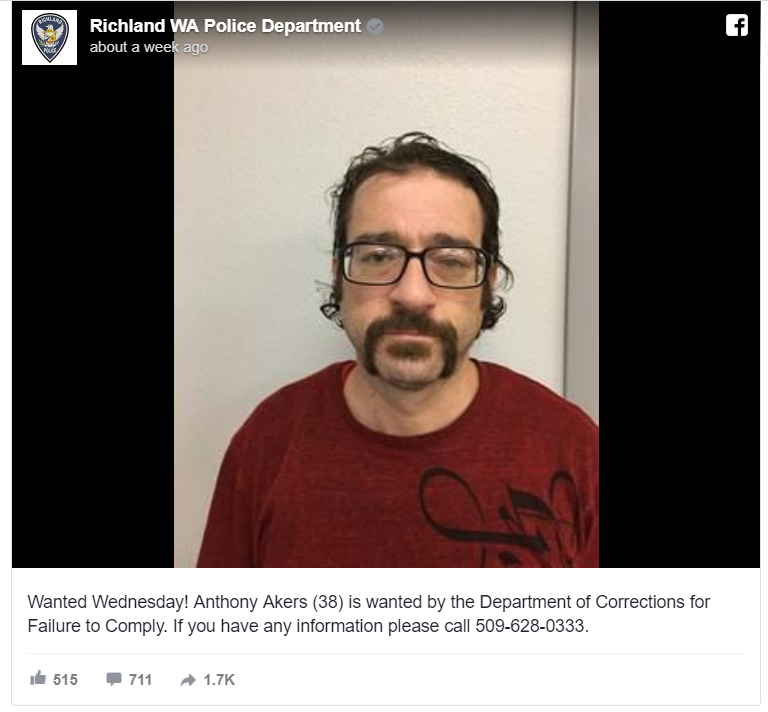 Last Wednesday, the Richland Police Department in Washington state posted a call-out for information on 38-year-old Anthony Akers in a weekly Facebook roundup of at-large criminals called Wanted Wednesdays. According to the post, Akers was the subject of a warrant for "failure to comply" with the terms of his probation. "Usually we put up the post and wait for some member of the public to call in with information or something useful," Sgt. Michael Harrison told NPR. Five hours later, Akers responded, writing, "Calm down, im going to turn myself in." When there was no sign of Akers the next day, officers tried to send him a direct message: "Hey Anthony! We haven't seen you yet. Our business hours are 8:00 am - 5:00 pm Monday through Friday. Of course if you need a ride you can call non-emergency (509-628-0333) and we will pick you up." And thus began a pseudo-courtship that has delighted "strange news" readers and Facebook lurkers across the Internet who have been following the budding bro-mance all week. "Thank you, tying up a couple loose ends since i will probably be in there for a month. Should be in there in the next 48 hours," Akers promised. Alas, he didn't mean it, ghosting all of Richland's finest — again. "Is it us?" officials wondered. "We waited, but you didn't show ... The weekend came and went. We are beginning to think you are not coming." "Dear RPD, its not you, its me. I obviously have commitment issues. I apologize for standing you up, but let me make it up to you. I will be there no later then lunchtime tomorrow, I know you have no reason to believe me after what i did to you, but I promise that if i dont make it on my own by lunchtime tomorrow I will call for a ride to assist me with my commitment issues. Thank you in advance to your response if you are patiently giving me another chance with us, I know i dont deserve it. A day later — Dec. 4 — he arrived at the department's doorstep. Beard and mustache recently removed, Akers documented the moment he pushed the door buzzer with a selfie. "Pushing the button," he wrote, adding, "yes, a bit later then planned but here and going in. Thank you RPD for letting me do this on my own." For the outside world, including all of his new online fans, he had another message: "See you in a month." An earlier version of this story and a photo credit incorrectly identified the Richland Police Department as the Richmond Police Department.